Passages to the Past: closing out 2009 with a bang! Ann More, fiery and spirited daughter of the Mores of Loseley House in Surrey, came to London destined for a life at the court of Queen Elizabeth and an advantageous marriage. There she encountered John Donne, the darkly attractive young poet who was secretary to her uncle, the Lord Keeper of the Great Seal. He was unlike any man she had ever met—angry, clever, witty and, in her eyes, insufferably arrogant and careless of women. Yet as they were thrown together Donne opened Ann’s eyes to a new world of passion, and sensuality. But John Donne—Catholic by background in an age when it was deadly dangerous, tainted by an alluring hint of scandal—was the kind of man her status-conscious father distrusted and despised. The Lady and the Poet tells the story of the forbidden love between one of our most admired poets and a girl who dared to rebel against the conventions of her time. They gave up everything to be together. 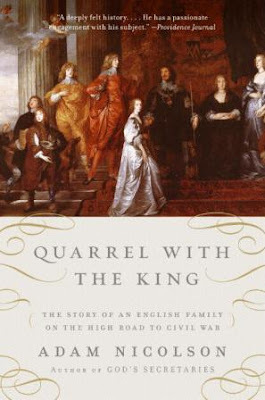 Quarrel with the King tells the story of the first four earls of Pembroke, their wives, children, estates, tenants, and allies, following their high and glamorous trajectory from the 1520s through 1650—the most turbulent and dramatic years of English history—across three generations of change, ambition, resistance, and war. The Pembrokes were at the heart of it all: the richest family in England, with old blood and new drive, led as much by a succession of extraordinary women as by their husbands and sons. It is also the story of a power struggle, over a long century, between the family and the growing strength of the English Crown. For decades, questions of loyalty simmered: Was government about agreement and respect, or authority and compulsion? What status did traditional rights have in a changing world? Did a national emergency mean those rights could be ignored or overturned? These were the issues that in 1642 would lead to a brutal civil war, the bloodiest conflict England has ever experienced, in which the earl of Pembroke—who had been loyal till then—had no choice but to rebel against a king who he felt had betrayed both him and his country. At other times, the Pembrokes both threatened the Crown and acted as its bruisingly efficient and violent agents. They were ambivalent figures: flag bearers for an ancient England and time servers in some of the most corrupt courts England has ever known; fawning courtiers and indulgent landlords; puritanical aristocrats and rebel grandees. Nicolson's book amounts to a study in all the ambiguities involved in the exercise and maintenance of power and status. Ellen Kellaway, orphaned at age five, was raised by wealthy cousins, but was never allowed to forget that her every advantage was owed to the charity of others. But when the son of a powerful London family asks for her hand in marriage, her world is opened up to untold wealth and social position. She never imagined that such an unlikely dream would come true. But despite these wonderful new developments in her life, Ellen continues to have the bad dreams that have haunted her since her youth. What was the meaning of the lifelong night-mare—the image of an unfamiliar room, a door opening and behind it a dreadful presence? Perhaps it was a message asking her to discover the secrets of her long lost family—the secrets of the ancient home of the Kellaways on the Far Island, off the wild coast of Cornwall. The year is 1846. In a cold parsonage on the gloomy Yorkshire moors, a family seems cursed with disaster. A mother and two children dead. A father sick, without fortune, and hardened by the loss of his two most beloved family members. A son destroyed by alcohol and opiates. And three strong, intelligent young women, reduced to poverty and spinsterhood, with nothing to save them from their fate. Nothing, that is, except their remarkable literary talent. So unfolds the story of the Brontë sisters. At its center are Charlotte and the writing of Jane Eyre. Delicately unraveling the connections between one of fiction’s most indelible heroines and the remarkable woman who created her, Sheila Kohler’s Becoming Jane Eyre will appeal to fans of historical fiction and, of course, the millions of readers who adore Jane Eyre. I love these posts, as well! I'm looking forward to the Bronte book, especially. Stop this. My hold list at the library is maxed. I had to cancel a couple so I could get the Holt book (large print edition though). I'm going to have to quit my day job just so that I can focus on reading all these great books! Too bad I can't get paid to just read...lol. Looks like some great reads! So they are now re-releasing Holt novels? I have that one and almost all of the others. OMG! Saving my money now!